class="post-template-default single single-post postid-1150 single-format-standard wpb-js-composer js-comp-ver-3.6.12 vc_responsive"
After its one-two race win in Mexico City, the Porsche LMP Team sees the deck being reshuffled for the sixth round of the FIA World Endurance Championship (WEC): On September 16, the six-hour race at the Circuit of the Americas (COTA) in Austin, Texas (USA) will likely be held in demanding heat. In recent years it started at 5 pm and ended at 11 pm which meant half the race took place after dark in cooler temperatures. For 2017, it has been rescheduled to start at noon and finish at 6 pm. The ambient temperatures at 5 pm were still over 35 degrees Celsius last year. In 2014, the race was interrupted because of heavy rain. Everything would seem to be possible in Austin. 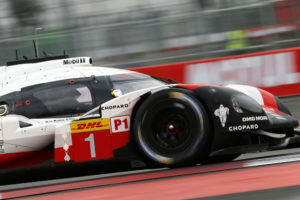 In what is the fourth and final season for the innovative prototype Porsche 919 Hybrid, the Porsche LMP Team is aiming to achieve a third consecutive world championship title for manufacturers and drivers. Porsche has now scored 198 points in the manufacturers’ world championship with Toyota on 141.5 points. In the drivers’ rankings, Earl Bamber (NZ), Timo Bernhard (DE) and Brendon Hartley (NZ) lead with 134 points. After wins in Le Mans, at the Nürburgring and in Mexico, they are 41 points ahead of the best placed Toyota trio. Neel Jani (CH), André Lotterer (DE) and Nick Tandy (GB) lie third in the championship (64 points). The race in Austin is a Saturday event – noon until 6 pm – and will be broadcast worldwide on the internet and television. The class 1 Le Mans Prototype (LMP1) develops a system power of around 900 HP (662 kW) that comes from a compact two-litre turbo charged V4-cylinder (nearly 500 HP/368 kW) engine and two different energy recovery systems – brake energy from the front axle combined with exhaust energy. The combustion engine drives the rear axle while the electro motor boosts the front axle with an output of more than 400 HP (294 kW). The electrical energy that comes from the front brakes and the exhaust system is temporarily stored in a liquid-cooled lithium ion battery.